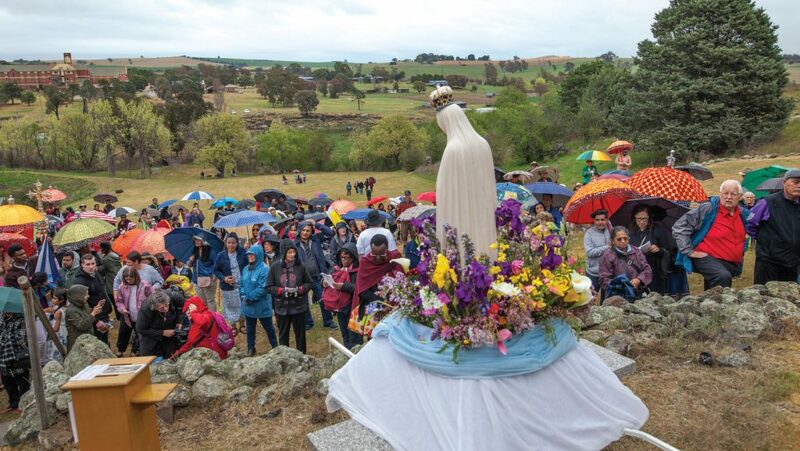 DEACON Matt Ransom says this year’s annual Marian Pilgrimage and Procession at St Clement’s Retreat Centre in October will take on extra significance with the Redemptorist Order currently celebrating its centenary at Galong. “St Clement’s was established in 1918, with the Apostolic Nuncio of the day opening the Monastery,” the event organiser said. Archbishop Yllana will be joined on the day by Archbishop Christopher Prowse. Deacon Ransom says being a significant occasion, the Marian Procession will have a particular focus on giving thanks to Jesus for this holy place and the Redemptorist’s presence in the Archdiocese. “Over many decades, the procession at Galong has gathered tens of thousands of Catholics from across Australia,” he said. During the day there will be the opportunity for Mass, the Sacrament of Confession, to pray the Rosary, a procession to the grotto and to be inspired by the speakers. In addition, the Catholic Church is in the midst of the worldwide Year of Youth, which was declared by Pope Francis. To facilitate this focus, the day of prayer and celebrations will begin at 8.30am with a Youth Pilgrimage from Galong Village to St Clement’s. The hour-long prayer walk will take place with an Icon of the Holy Family and a large Cross, being carried by the young people of the Archdiocese and Archbishop Prowse. Deacon Ransom, who serves as the Archdiocesan Confraternity of Catholic Doctrine Coordinator, says the warmer month of October is proving to be a great blessing. “Last year’s procession turned out to be a wonderful multicultural family day of prayer and festivities, he said. The Archdiocese is again calling on pilgrims from local parishes, ethnic communities, clergy and religious take time to enjoy one another and journey with Mary to the heart of Jesus. “We would love for members of EVERY Parish, EVERY community and EVERY school to be represented at our 2018 Marian Procession,” Deacon Ransom said. “Pilgrims are asked to bring food for the day, an umbrella for shade and a chair to sit on. – The Marian Procession is on Sunday, October 14 at St Clement’s Retreat Centre, Galong. It will start with Confession at 10.30am, followed by Mass at 11.30am. A multicultural lunch follows at 12.30, with the procession to the Grotto beginning at 2pm. The Marian sharing will be conducted from the Grotto.